This year I was beyond ecstatic and completely humbled when asked (well, I wasn’t really given a choice, but I would’ve said yes regardless ; ) by one of my best friends (Erica) to be a bridesmaid in her upcoming wedding. 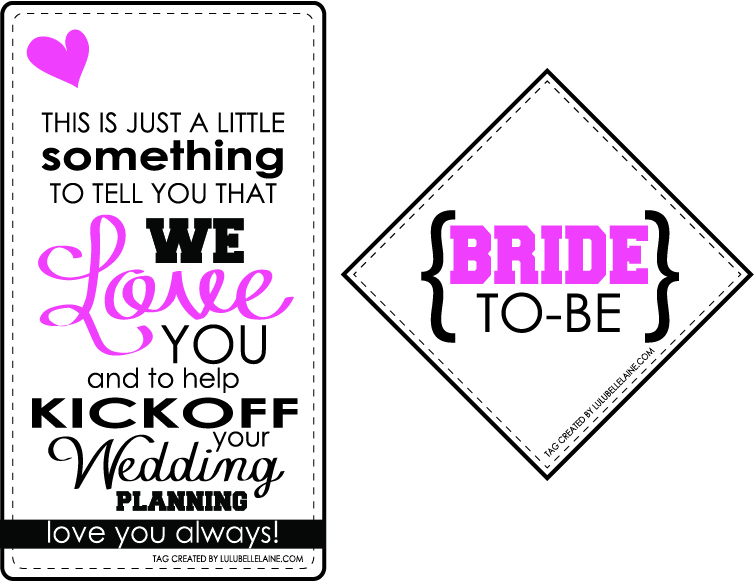 The week before our planned dress-shopping excursion, the other bridesmaids and I, my other best friend (Dominique) and a close mutual friend of the bride (Hannah), put our heads together and came up with this super cute and 100% useful bride-to-be gift idea! After we put all of the items in this cute tote bag (that we had also purchased as part of the gift) I stuffed it with tissue paper and created those cute tags. So guess what?! Although my tags were custom-made by yours-truly, I have redesigned them just to share with you! Check them out! 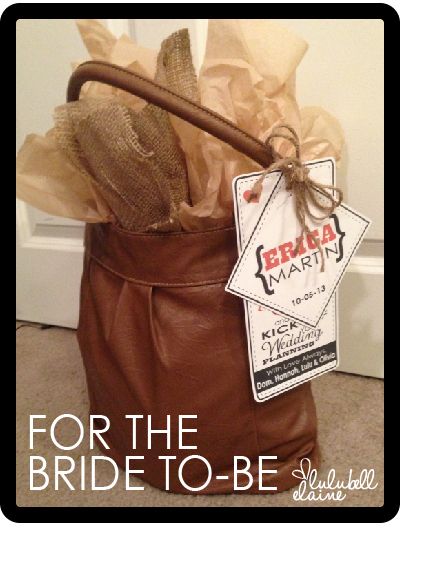 You can get your free bride-to-be gift tags by clicking on the link below. Hope you enjoy! And happy wedding planning to all the brides-to-be out there! This post is featured in the Sundae Scoop Link Party hosted by I Heart Nap Time. Check it out! You get to the grocery market and can’t remember what you need or always forget something. You make a grocery list so you DON’T forget but you end up running a marathon through the grocery store because you’re going back and forth on your list. Well, I’ve created a solution to help us both out! This is my Weekly Grocery List. How simple is that! Not to mention just how darn cute it is! 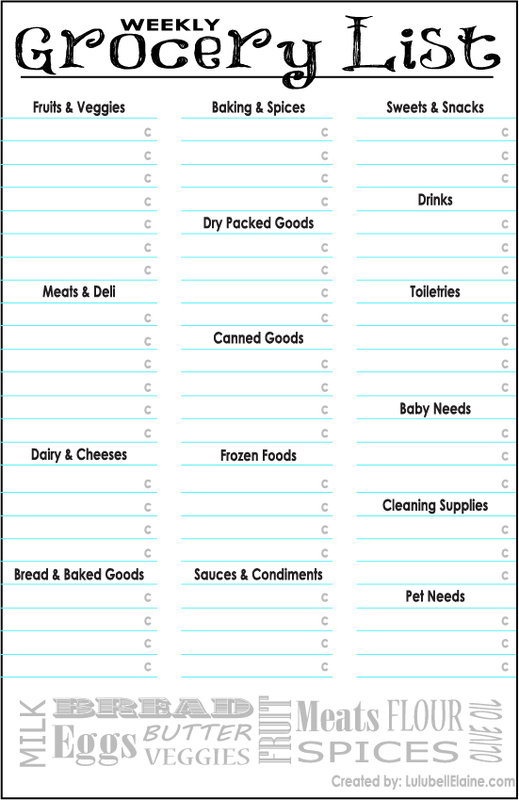 So, create your own own weekly grocery list with categories and coupon tracking OR do what’s easy and download your Free Weekly Grocery List Printable here! Hello & happy Monday everyone! 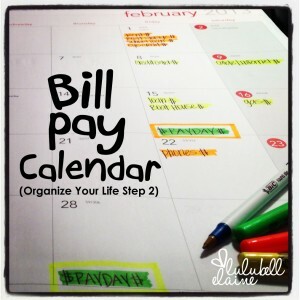 Hopefully everyone is feeling a little less stressed after Step 2 of organizing your life (Bill Pay & Finance Calendar). Now let’s continue! It’s on to Step 3! If you’re REALLY looking to get your life organized, you can’t afford to miss this step! This is my home Bill Pay Station. Simply put, it is a basic desk organizer that holds everything you need to pay your bills. After sorting through all of your mail and opening all of your bills from Step 1 and setting up your Bill Pay Calendar from Step 2, this is where you’d go next. Whether you pay your bills every week, bi-weekly, or bi-monthly like we do, this is a special DESIGNATED AREA where you will come to pay your bills. The best spot for this station is RIGHT next to your Bill Pay Calendar from Step 2. 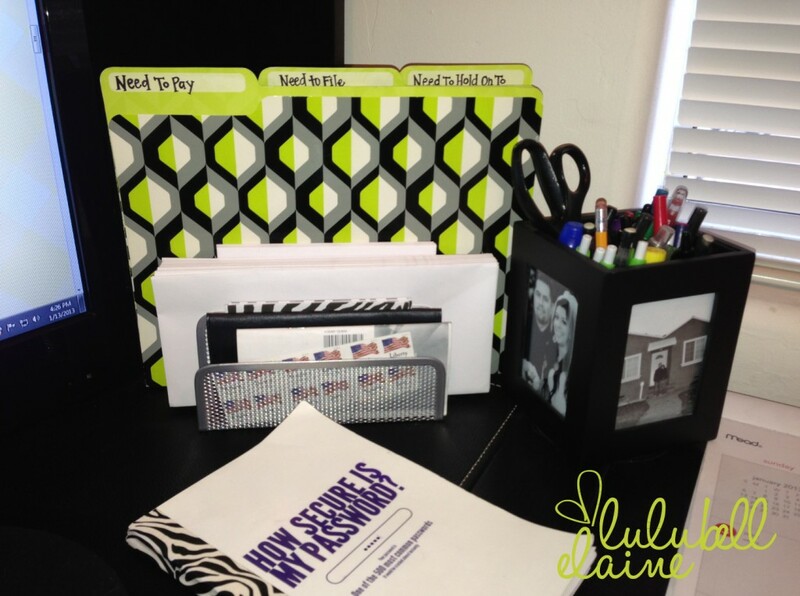 Making a designated area for this task (paying bills) creates organization in your home. It creates repetition which makes it easier and in turn, much less stressful! Paying bills is now a breeze for me! I take about 20 minutes twice a month (we get paid bi-monthly) and it’s done! No stress and a happy hubby home life! NEED TO HOLD ON TO: This anything from hotel registration information for an upcoming trip, printed tickets for an upcoming concert or a receipt/claim ticket that you will need in the future. Having a stapler and paperclips nearby is a great idea too! I hope the stress is slowly melting away! 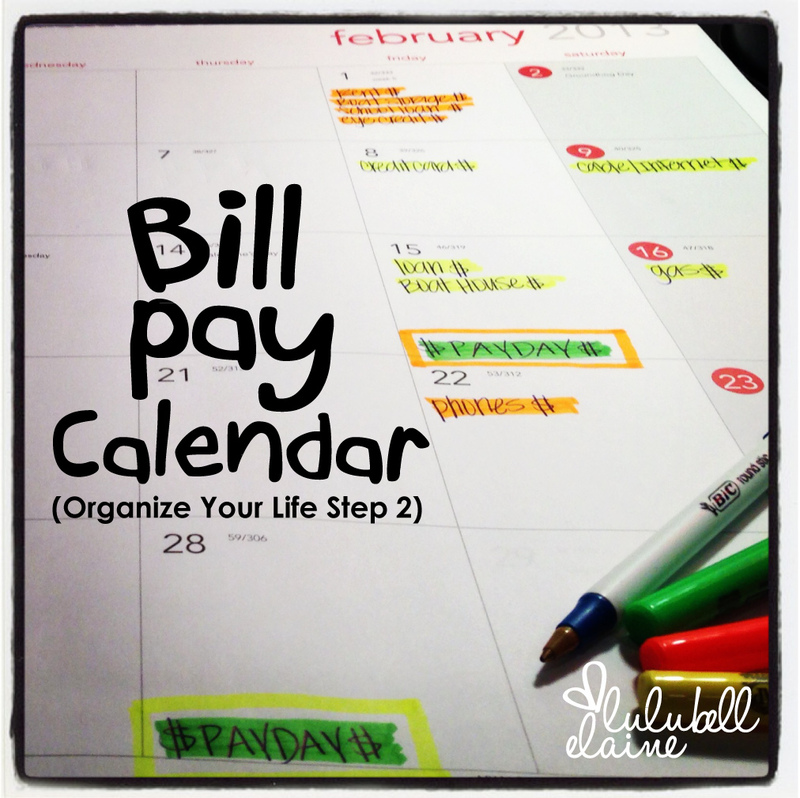 So get your Bill Pay Stations in line and join me next Monday for Step 4 of Organizing Your Life in 5 Easy Steps! Step 4 is by far the single most important system EVERY person should have in place in their home. Don’t miss it! This post was featured in the Sundae Scoop link party hosted by I Heart Naptime. Check it out! 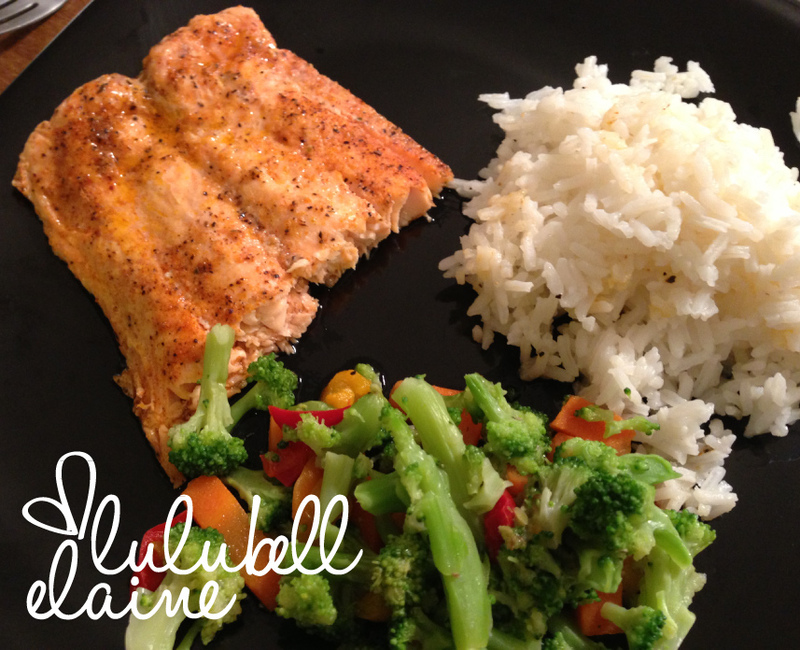 Blackening Seasoning Recipe – The Best Seasoning for Salmon and Chicken! Ooooooo…..my taste buds water just thinking about it! Blackening seasoning, or blackened seasoning as it is also referred to, is now my number one go-to spice when I’m cooking either salmon or chicken. Last year the hubby and I went to a family gathering where his cousin’s friend jumped on the grill and whipped up some of the best salmon I had ever tasted in my life! When I asked the friend, who I found out later was a culinary genius, his secret to such tasty salmon, he said “Blackening Seasoning, you can find it at any market.” So I was on a mission! 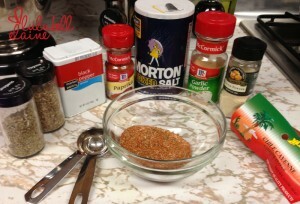 Mix all of the ingredients well and store in a seasoning shaker. When you’re ready to use it, shake generously over your salmon or chicken before you cook it and voila! The only salmon seasoning and chicken seasoning you will ever need! Next, lightly cover a piece of foil with olive oil, place your salmon on the foil. I like to squeeze a little lemon on it first (sometimes I’ll even marinate it over night in lemon), then generously shake on the blackening seasoning and wrap with the foil so the salmon is completely covered. Put salmon in the oven. 10-15 minutes for salmon fillets about 1″. 15-20 minutes for salmon fillets about 2″. For your steamed veggies, this is all preference. I generally work with whatever I have, but normally I like to keep the Green Giant frozen vegetable medleys on hand, but every once in a while I’ll have some fresh zucchini or broccoli. An easy 4 minutes for the frozen veggies or 10-15 minutes for fresh veggies on the stove in a steamer should do. This post was featured on Mandy’s Recipe Box Totally Tasty Link Party. Check it out! Welcome back! 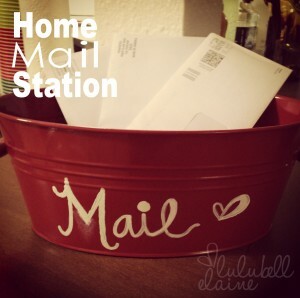 I hope everyone had a chance to check out Step 1 of Organizing Your Life: Mail & Receipt Stations. If you did, and you’d like to share with all of us, please send me your pictures! Now it’s on to Step 2! Let’s face it, keeping track and keeping up with bills can sometimes get a little hectic. Online Bill Pay through most banking institutions has made this task a little easier, but there’s no way of keeping track of your INCOME vs your outgoing bills through this avenue. So, I came up with this simple calendar system that has made keeping track and keeping up with bills a breeze! Now, not only has it helped with getting us organized, but it also created a budget system for us which, as we know now, is the first step to financial peace (if you follow my blog, later you will read my series on financial peace based on the principles of finance guru Dave Ramsey). So here it is! Gather up all of your bills or make a list of each bill along with their approximate amount or minimum payment, and write them on their respective due dates in the calendar. Finally, when payday comes, before spending it all on that new pair of shoes you’ve had your eyes on, or the tickets for that big upcoming concert, PAY YOUR BILLS FIRST! Pay every highlighted bill for those weeks (or that week) and whatever you are left with is your budget for the remaining necessities like food and gas for your car, as well as entertainment. Don’t wait until the bill is due, or until it’s too late. Follow this system and you won’t ever be late or forget a payment again! Hopefully it will also act as a starter budget for you as well! CONGRATULATIONS! You’ve now created a simple budget! 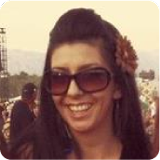 This system will become second nature to you by month #2 and you’ll be paying bills with ease! One more stress relieved and step #2 complete! Now go on and get started and meet me back here next Monday for Step 3 of Organizing Your Life! In the mean time, stay tuned for a yummy recipe that you WON’T want to miss!